Aurelia’s power is a little lower than I would have guessed, but in reality it’s only slightly lower than her hyper-aggressive version from Gatecrash. I am certainly intrigued by that color-matters ability, which is like something straight out of the Shadowmoor block. I also like that her mana cost positions her at exactly the time an aggressive deck usually wants to punch through defenses or finish off an opponent. Clearly she was intended for use in her guild, and it’s fantastic that she still gives the power bonus to the creature even if it isn’t both colors. I wouldn’t forget about some of the cards from said inspiration, even now: many of Eventide‘s hobgoblins and duergar are not super-efficient by modern terms, but there are some that remain quite advantageous and get both bonuses while being easy to cast! For being only four mana, Aurelia 2.0 is priced to move. With no other creatures, Aurelia attacks in as a 4/5 with vigilance, trample, and flying…that’s pretty good! Of course, you don’t need to pump her, and we all know Boros plays well with a wide board. Dropping Aurelia on turn 4 and pumping a Skyknight Legionnaire seems like a power move if ever there was one! 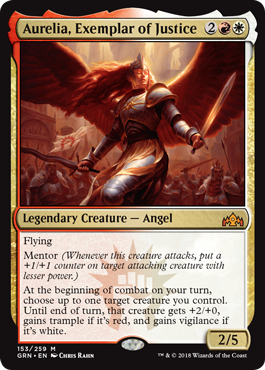 On top of that, Aurelia has mentor to keep adding power to the board, and that 5 toughness is a fairly sweet spot to avoid burn spells (and can’t die to Justice Strike). She’s powerful alone and with the patented Boros Army, and she’s apt to make many waves in the Standard to come.